As I write this, the United States is celebrating 237 years of independence. At PassingThru Enterprises, we’re celebrating freedom, too. Since 2008, when we started this blog, we’ve been steadily working on a business and personal philosophy centered around independence, income diversification, and simplicity. Our nation’s Founders had faith in ideals and ideas, but even in their wildest imaginations couldn’t foresee the outcome of the process they set in motion. 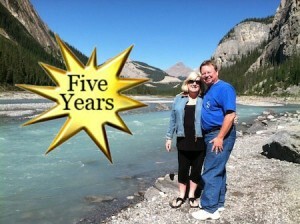 Five years ago, we took a leap of faith, too, which has rewarded us in ways beyond any we expected. In celebration of our five year milestone, this post takes a look back: where we’ve been and what we were thinking – what were we thinking anyway?! – and a look toward the days ahead. Hope you enjoy it! Return to Denali – “I realize that this moment is a great gift. Given the person I am, this place is exactly where I need to be. I am blissfully closer than I have ever been to doing exactly what I must be meant to do.” If I had to pick a favorite Alaska post, and that’s tough, it would have to be this one. 2009 – Meandering down “No-niche Road,” nonetheless some recurring themes begin to emerge: forging (or would it be foraging?) ahead with unconventional plans in a free-falling economy and family memories. Our travels this year were closer to home. Thoughts from Hours Spent with Daylilies is a reflection and allegory on persistence and faith – values which my father imparted through his gardening. Bob and Mary’s 80th Birthday in Galena is a rollicking memory of my late mother’s siblings, ever so bittersweet as Aunt Mary, her husband Charlie, and now Uncle Jack have since passed on. 2010 – Little did we know we were creating staying power. This year’s activity ranged from our first book, The Narcissist: A User’s Guide, to posts that continue to draw hundreds of hits each month. Finding Dimes – Out of left field, documenting what we found out is a fairly-widespread phenomenon, this post is routinely first in Google results for a variety of “finding dimes after someone’s death” searches, and gets hundreds of hits each month. There are beautiful shares in more than 80 comments, too. Looking Into Forever – This first post in a series of 4 documented another affirming sign that appeared frequently thereafter: the eagle totem. We had gone north to the shores of Lake Superior for healing and reflection after Pete’s mother passed, and a shockingly close encounter with an eagle spurred a quest for understanding. “The Eagle: symbol of spiritual power and illumination; their energy is healing and aids in creation.” In Looking Into Forever, Part 4, I open up about a magnetic connection with Lake Superior that many others share. My Three Words for 2010 began an annual tradition of choosing three words that would affect actions I took throughout the year. This first selection – Drink.More.Champagne – prodded a focus on the positive, celebratory aspects of life that continues to this day. Understanding and Moving On From Difficult People , written to complement the conclusions reached in The Narcissist: A User’s Guide, recommends disassociation and detachment from toxic relationships in order to move on with a happier life. 2011 – In the midst of dramatic personal change, we downsized out of our home and Pete quit his day job a couple months later. My Three Words for 2011 were prophetic: Only.What.Matters. We were honing our priorities and narrowing our focus, moving further into positive territory. Still, not everyone in our offline world “got” what we were doing. What Our Move to Location Independence is Not and What We Learned in Our First Month of Location Independence attempted to clarify. We took a series of extended road trips throughout the rest of the year, and patiently explained to anyone who would listen that no, Pete hadn’t retired, and yes, we were making money on the Internet. Still, the reactions of many we knew offline remained confused and unconvinced. We realized that it takes a certain type of person to take a leap of faith into the unknown. In The Consequences of Perpetual Indecision and Uncertainty, we argued against mental inertia and risk aversion. Folks were still feeling trapped by economic circumstances, yet wanted to keep playing safe. We encouraged thinking about why You Need a Plan “B” to create income diversification as a hedge. Getting Real: How an Honest Reality Check will Improve Your Life examined the power personal beliefs and fears have over taking action, and an after-the-holidays Reality Check: Spending Doesn’t Make You Feel Better reiterated how a simplified lifestyle makes room for more happiness. One of our favorite road trips in 2011 was to Memphis, At the Crossroads of Blues and Rock’n’Roll. This trip set the stage for more theme-based travel plans in 2012. Our Location Independence: Hawaii Version detailed how we’d planted the seed with “unforgettable experiences, didn’t sacrifice any work-related priorities, and proved to ourselves that location independence can work on a bigger scale when traveling to distant destinations.” At the end of the year, we were still explaining Why We Were Moving to Kauai, though. Are You Eating Fear Soup? was another popular post, written to extol the benefits of claiming personal power and control over one’s circumstances, as was Decision Making: Are You Pondering or Paralyzing? By this time we’d decided it was time to fish or cut bait with our Hawaii plans. As we grappled with the logistics, we embraced the idea of an even more simplified lifestyle, and struggled with conflicting emotions in Going Home and Home for Christmas. Theme-based travel in 2012 brought a lot of fun as we checked off state after state during our last months on the mainland. We chased down the best Kansas City barbeque joints for the winner: Barbeque Restaurants: The BBQ Shack. Our history-based summer road trip covered about 4000 miles in 12 states. We needed reconnecting, simplifying, and reassessment when we returned. Pete came out with two successful niche information products: How to Get Started on Zazzle, and More Products, Less Time: A Zazzle How-To Book, complemented by a growing Facebook page community. I co-authored The Narcissist at Work, for those “fortunate” to be stuck in a toxic workplace relationship. Our income diversification plans were solidly in motion! 2013 – At last the move to Hawaii was imminent. It dawned on folks that we were really going to do this thing! Up until the day we left, we were very much “In.The.Moment.”, anticipating hopefully that we could maintain the mindset once we’d relocated to the Garden Isle. Instead of packing for our move to the tropics, a last-minute, last hurrah with Lake Superior had us in Grand Marais: Our Au Revoir with the Gichigami dogsled races. One Month In, our Kauai lifestyle was proving to be simplified and much less complicated when compared with the Mainland. It still feels great: we’ve downshifted even further and we don’t miss our stuff, getting more out of having less. We’ve come to terms with ongoing negativity and have succeeded in minimizing it. We do this by making a conscious effort to understand its effects (Negativity Bias: Override It for Greater Happiness), and relegating its perpetrators to their proper place (Mean People: Understand and Protect Yourself). As one might expect, living in Paradise is a very happy existence for a variety of reasons. Daily life is filled with all things tropical and being surrounded by breathtaking scenery brings out the spiritual (On the Path to Non-Attachment). Work is fulfilling and the ideas are flowing as we merge into new rhythms. Future travel plans are in the works. Shortly after we arrived on Kauai, we scored tickets to the Winter Olympics in Sochi, Russia for next February, 2014. We’re excited to narrow all the possibilities associated with such a long journey into what looks to be a fabulous experience at the beginning of next year. For now, we’re anticipating good times with visitors coming – hurry up and get on out here! – and continuing to enjoy daily life. Business plans are rockin’ and we’re looking forward to more product introductions, as well as other things we’ve got up our sleeves (when we wear sleeves, that is). All in all, we’ve worked damn hard to get where we are, and we’re loving every minute! Cheers! Hi Betsy .. it’s been great following along with you and Pete – I do so applaud your enterprising approach to life .. and am so pleased it’s all working out – I know planning and being aware helps a great deal ..
Hi Hilary – Thank you! It’s a great milestone and while we had no idea where things would go back then, it’s been an awesome journey! Cheers! Congratulations on five years of blogging. I look forward to your posts and perspective. It is fun to look back and see your progress towards meeting your goals. You are an inspiration. I see the world through different eyes and realize life can be anything I want it to be. I know you are also an influence on my children and how they look at their futures. The sky is the limit! Congrats on your success. I’m learning lots from you – I signed up for your Zazzle e-newsletter a few weeks ago. My biggest problem is trying to tackle too many things online since it’s my only source of income — and forgetting to start each day with gratitude. i wish you continued success! Hi Angela – Thank you and welcome to PassingThru! You’re right, it’s easy to overwhelm yourself. We’ve been there. What we found, though, is after a while, your best prospects will prove themselves and you can release the activities that aren’t serving you. I love that you embrace gratitude, too. Thank you for your comment and best wishes!